DeanMurdoch wrote: Kyle Dranginis was slated to start at the "3" for Gonzaga before Byron Wesley transferred over. I doubt it's even a given that Wesley will start over Dranginis, but for sure his addition only bolsters what will be a deep and talented Gonzaga team. Good thing they can only put five on the floor at a time! I think this is one of those "the cream will rise to the top" situations. Dranginis was an excellent "6th man" last year and has had 3 years to learn Coach Few's system. Wesley is probably the better defender and was the best player on an otherwise lousy USC team, but with only the summer to learn the system before playing in the all-important preseason games that help determine the RPI, it's probably true that Wesley will come off the bench for awhile. I read somewhere that one of the reasons Wesley signed with GU is because the staff told him there was no other player like him on the team..... The other reason he signed is because he wanted to go to the NCAA Tournament.....I don't see that being a problem. DoubleDipper wrote: Wesley is probably the better defender and was the best player on an otherwise lousy USC team, but with only the summer to learn the system before playing in the all-important preseason games that help determine the RPI, it's probably true that Wesley will come off the bench for awhile. Perusing the GU Board, I thought I read that Wesley was an indifferent defender at USC. I didn't see him play. up7587 wrote: Perusing the GU Board, I thought I read that Wesley was an indifferent defender at USC. I didn't see him play. Actually, Wesley was at one time the top rebounder and one of the best defenders at USC until he was called upon to be the leading scorer and assume the roll of team leader. He was always considered a scorer coming out of high school, but he's worked very hard at his defense and now takes great pride in shutting down the opposing player and grabbing rebounds. I didn't see him play last season, but my recollection from seeing him play his first two seasons is that he may not be the pure shooter that Kyle Wiltjer is, but he's a much better all-around athlete and defender who can also score plenty of points. Gonzaga plays the transfer game better or as well as anyone in our conference. They appear to be the destination of choice for good players ending their careers as in this case or for the slightly disaffected from larger schools. Is there anyone else in the WCC touting as good a list of transfers in recent years? Also would like to know in what post graduate major Mr. Wesley intends to enroll that was not available at USC. I have a growing suspicion that the condition set forth in the rule is being abused. I understand that the new D1 university must offer a major course of study for the graduate student athlete unavailable at the old. Interested if the academic opportunity really plays a part or the schools are colluding to leave an impression that it does when it really doesn’t? Pray tell us what Mr. Wesley found as a major at Gonzaga, primarily an undergraduate liberal arts school, unavailable at the much larger research institution? I suppose Jesuit Apologia is unlikely to be offered by USC . . .
Oh, come on. The original rule about making a transfer sit a year was allegedly about academics, and it never was. It was about keeping control of a player. Here is an alternate vision on the transfer rules, including changing the rule to allow any student to transfer without sitting. The graduate transfer is ostensibly to further education after graduation--the suggestion you make about the reasons for the original transfer rule are silly given that almost all transfers under the old rule were and are for basketball reasons and require nothing from the new or old institution academically. The graduate transfer rule is limited to instituitions which provide a post graduate degree that is unavailable at the old institution: it is a specific requirement that the NCAA bothered to place in the rule. If the rule is real there ought to be substance. A little nuance would accept that graduate studies are often pretty individualized, so if a person wishes to study under a professor in a certain specialty he should be able to, even if his old school has a similar degree. That's an academic consideration, not a sports one. Now explain the rule that the graduate rule is an exception to academically. it makes no sense at all but to bind a player to the old school, more often for sports, and NOT for academic reasons. It doesn't take a lot of nuance to figure out that a rule that only applies to Football and Basketball isn't academic. If colleges were really interested in what is best academically there wouldn't be the one and done rule which allows players to play a year taking only TWO courses, and UCONN would graduate more that six players in a decade. 1) Stay at the same school I was at and take post-graduate courses. For much of it, it would be the EXACT same classes I had just taken as an undergraduate, but with extra work tacked on to allegedly make it a master's level course. 2) Go to a different school for post-graduate work and get an experience at another institution. Obviously, I picked #2 and that's how I ended up at UP in 2005. In fact, almost everyone I know that has moved on to master's studies has done so at a different school than they did their undergrad at - and for very good reason. That's why the fifth-year transfer rule makes sense for me, and I don't really care if the weight of the decision is 97% basketball and 3% academics. If a player qualifies under this rule, then obviously he has graduated from his institution! Surely he's been there long enough to fulfill whatever obligation you may feel he had to the school and vice versa? NOTE: I reserve the right to completely reverse my opinion on this in the future should the Pilots lose an impact player due to this rule. DeanMurdoch wrote: NOTE: I reserve the right to completely reverse my opinion on this in the future should the Pilots lose an impact player due to this rule. Three cheers for Thomas van der Mars, who has already graduated and will be back for his last year of basketball eligibility at UP! Interesting....3-star SG Isiahiah Sweeney from Compton, CA has signed with PSU. He had a number of D-1 offers including Gonzaga at one time. Was this a case of a recruit waiting too long to commit and finding the only spot left open was at PSU......or is their something really appealing about playing at PSU? I guess we'll see. It would seem at least three 2014 recruits who were expected to go on their missions over the next couple of years have decided to delay or cancel their missions. With 13 players already on scholarship, and not wanting to lose the recruits to some other school, those recruits have been convinced to pay their own way at BYU. Those three, and three other "normal" walk-ons, will make for a very crowded bench with 19 players. According to the BYU website, paying their own way at BYU will cost an LDS student only $4850 per year for tuition (non-LDS tuition is $9700) as the LDS Church subsidizes all students from the tithing of the church members......stating: "In principle, each student attending BYU is on scholarship." Hmm, if "in principle" they are on scholarship......does that mean BYU is will actually have 19 players on scholarship? It would seem to me if a player gets any type or "institutional" money it should count toward the 13 player limit!! Nope, not the way it works. Students are free to accept any scholarship money that is normally available to non athletes without it counting towards athletic scholarship limits. So, that needs scholarship, National Merit Scholarship, Lion's Club, Royal Rosarian, Pell grant, Robertson grant, State scholarship, or in this case Church scholarship can be accepted and not count as long as other student non-athletes in your demographic can receive them on the same basis. Harvard doesn't give athletic scholarships, but most students pay nearly nothing over their four years. The last time I checked a student there would expect to pay under 10K for their four years unless family income is pretty damn high. Sometimes those scholarships can be pretty specialized. Harvard, for example, has an additional scholarship available for any descendant of a member of the Harvard classes of 1889 and 1907, or descended from a guy named John Austin. In theory, a student athlete could accept a scholarship available to anyone over 7' and not have it count towards athletic limits if the school could show that '7 non-athletes receive them on an equal basis. That would be pretty intriguing for a rich school, since David Epstein tells us that 17% of all 7' people in the country between 20 and 40 are currently in the NBA. There can't be that many scholarships you would have to offer for kids between say, 17 and 22.
joshhorton wrote: Cohee committed to Seattle today. Kind of wish he went to the WCC, great talent and a good kid. I wish him the best. Hmm, Jadon Cohee from BC did sign an LOI with Seattle U, and all indications are he's been in school at Seattle U. this summer, but for some reason he's not listed as part of the Seattle U. roster for 2014-15. Jadon is in Seattle...looks like the Redhawks have rolled over their roster with the returners from last year but haven't added their four incoming freshmen and one Juco guy yet. DeanMurdoch wrote: Jadon is in Seattle...looks like the Redhawks have rolled over their roster with the returners from last year but haven't added their four incoming freshmen and one Juco guy yet. DTLegend wrote: Per his twitter account, D'Marques Tyson has commited to the Pilots. The Seattle Times ran a long, front-page article on Sunday about the involvement of Steve Ballmer (Microsoft CEO; owner of the LA Clippers) in the high school basketball program at Lakeside School in Seattle. D'Marques Tyson attended Lakeside during his junior season, and his recruitment to the school seems to be among the questionable practices carried out under Ballmer's strong influence. Tyson is quoted in the article. Makes me wonder about the circumstances that led Tyson to leave Lakeside and attend high school in North Carolina. As a subscriber to the Times, born and raised in Seattle, it certainly was an interesting read Sunday morning. I know all of those names mentioned and without going into details or slamming anybody here, it's simply unfortunate that adults continue to act a certain way and kids are caught in the middle. Recruiting and academic leniency lives on. Too many horror stories over the years of adults taking advantage of young athletes in the short term under the guise of "helping" the athlete, but in fact totally screwing up their future opportunities. The only way to curtail this sort of activity, IMO, is to expose it like the Times has done, and for AAU and college coaches to shun those adults who perpetuate such programs. 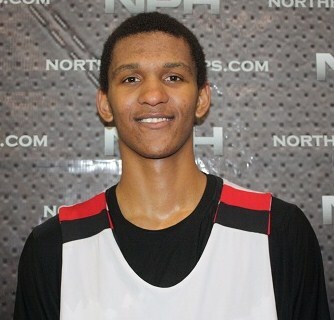 DoubleDipper wrote: The great Andrew (one-and-done) Wiggins decided on KU instead of UP this year, but that shouldn't deter the Pilots from going after another Canadian, Tristan Etienne for 2014. Apparently Tristan wanted to stick "closer to home" --- he's decided to go to UW. Just two weeks into classes and five days into practice Tristan Etienne has decided to leave UW for "personal reasons." Hmm....I have no idea what that would mean eligibility wise if he were to enroll elsewhere. He's 6-10! DoubleDipper wrote: Just two weeks into classes and five days into practice Tristan Etienne has decided to leave UW for "personal reasons." Hmm....I have no idea what that would mean eligibility wise if he were to enroll elsewhere. He's 6-10! Wow, that's unexpected. I don't think he has any attractive NCAA options now besides either paying $50,000 to attend UW on his own dime to satisfy NLI requirements, or burning the NLI and losing a year of eligibility AND attending his next school for a whole academic year besides playing. Maybe I'm wrong here, I don't have the greatest knowledge of how the NLI works. That, or he goes to UBC or Trinity Western at any point and can play pretty much immediately. Most likely when second semester starts in January. My bet's on this. Another alternative is jr college and transfer after two years. "A funny guy" who needs "to work on my English." The recruiting board is getting a little thin for the Pilots. This quote is from September 2013 when UP recruits Jacob Lampkin and Kaleb Warner committed to UOP. Today, Warner has said he is transferring from Pacific. I watched both those guys pretty closely during my trip to Stockton this year, and both showed great promise for the future as early as this coming season. It's disappointing when it doesn't work out for a student-athlete, and there are obviously a number of reasons why someone transfers, but frankly, I wondered why these two NW guys chose Stockton in the first place. Warner has committed to North Idaho College, a two year community college in Coeur d'Alene. No, that's not where Xubi transferred.....he's at NAIA College of Idaho in Caldwell; a much smaller school.